72" x 80" and 75" x 82"
Made by Margaret Mason from Marietta, PA. Husband was Joseph and family descended from Edgar from late 1700's. 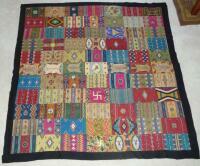 After quilts were made, Father died and family left area. In Tony Hyman's Handbook of Cigar Boxes He says "Flannels were collected from the coupons that were enclosed in cigarette packs. Catalogs (which cost 2 cents postage) were sent and then the flags, etc. could be ordered by size and description. The practice of inserting these premiums started in 1890 and finally died out in the 1930's in Europe due to the cost of producing both the silk and flannel items and the shortage of paper during WWII." Americans lost interest in these mostly after WWI. You will notice that these flags represent countries when most were still monarchies prior to WWI and most American flags came with 46 stars and 48 stars after 1912. 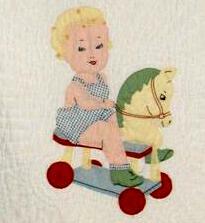 This flannel quilt top was made in 1913 in Saginaw, MI. 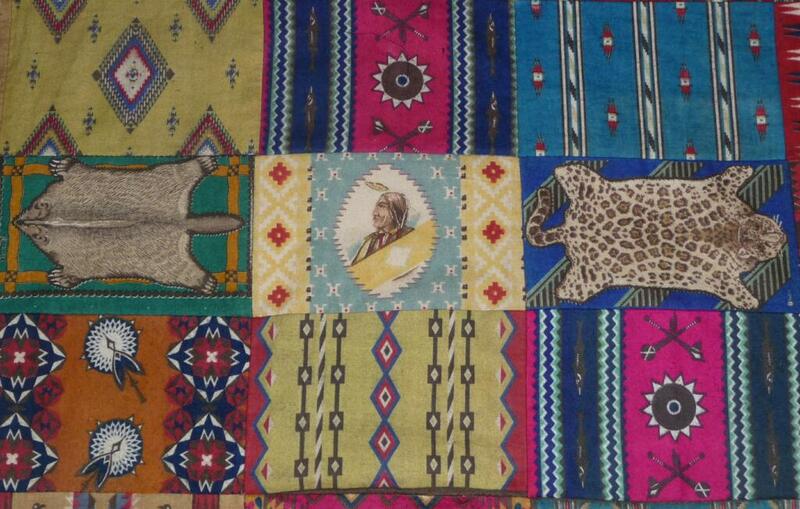 from 71 tobacco premium flannels of Indian blankets and 6 very rare animal pelt designs. The blocks (5" x 8.5") are neatly sewn together with tiny hand stitching. 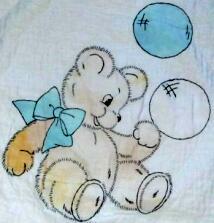 It is in pristine condition with no tears, holes, fading or stains. 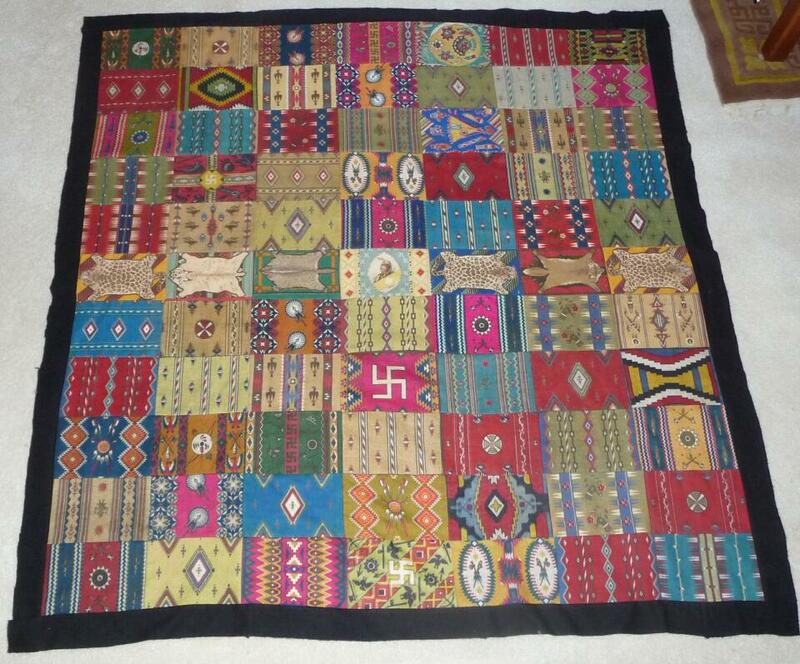 Egyptian Straights, Fatima, Luxury, Zira, Sovereign, B.V.D, ,Zoya, Tokio and Lande Cigarettes put silks in their packages of women, flags, fraternal organizations, animals, flowers and plants, sports stars, butterflies, Indian blankets, etc. Most of these premiums came from American, English and Canadian companies and were made in NY, England and Canada. 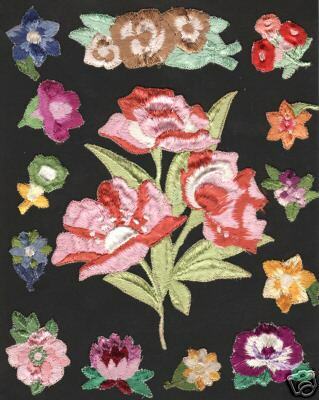 These are assorted silk Embroidered Flowers from tobacco premiums that usually measure 1”x2”. 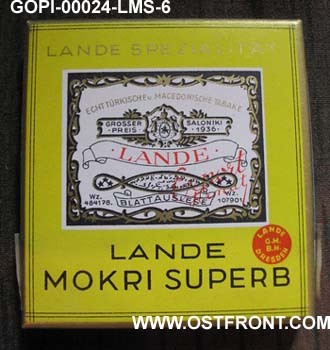 Original German WW2 packages Lande Mokri Superb cigarettes. These are the packages of 6 cigarettes and are the exact size and quantity that were issued to German WW2 soldiers in the frontline supplementary box. They are in great shape and have an intact tax stamp (in fact these came still wrapped in the original shipping packaging (see the picture above). They measure 2 5/8" x 2 3/4". It stands to reason that Hitler would not put flags of other countries in the German cigarettes. 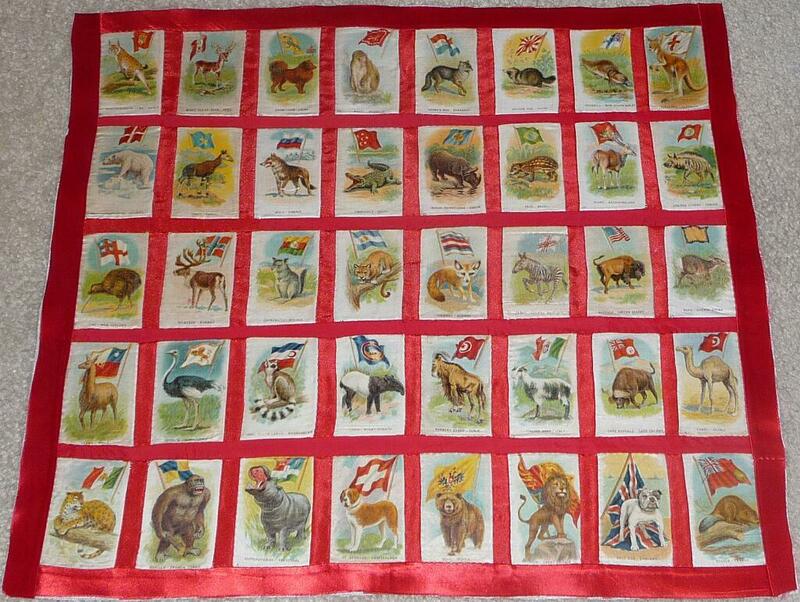 Animals with Flags Framed - 1915 - 16' x 18" Made from premiums from the Imperial Tobacco Company of Canada. 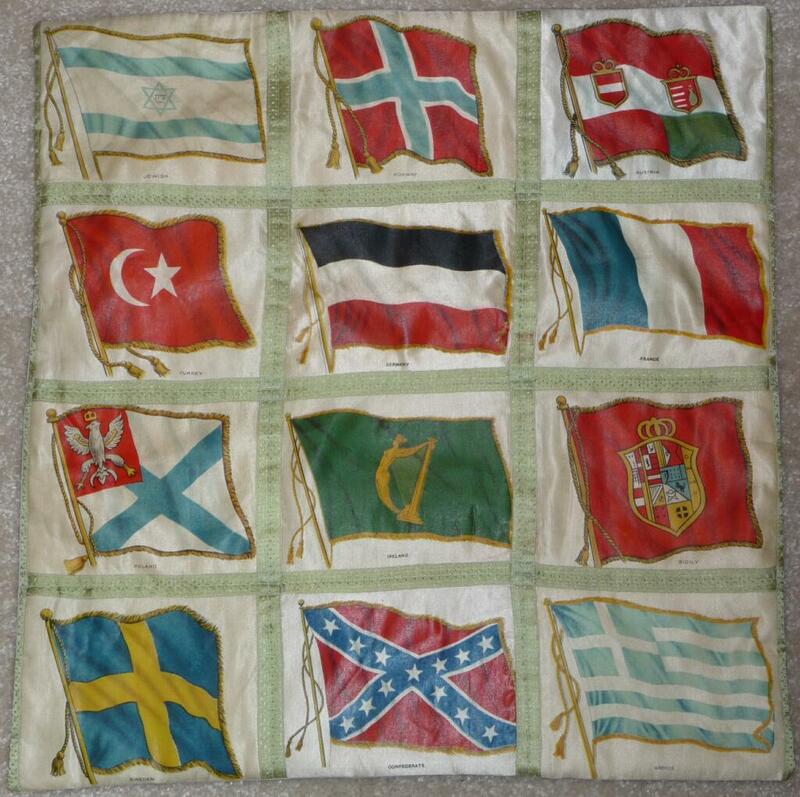 WWI Flags Pillow - 1912- 24" sq. 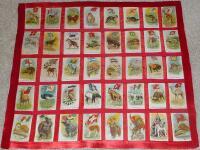 88 flages made from premiums from the Egyptian Straights and Sovereign cigarettes. 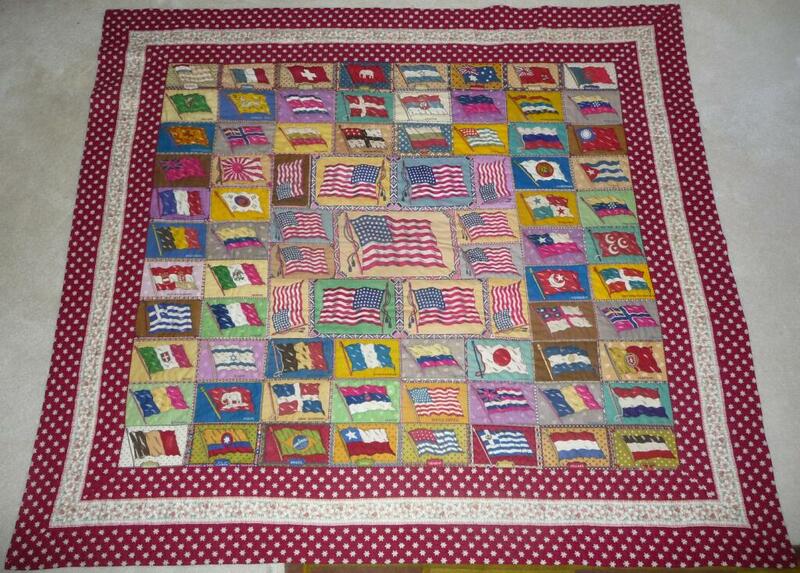 Over stitched with green silk ribbon between all flags. 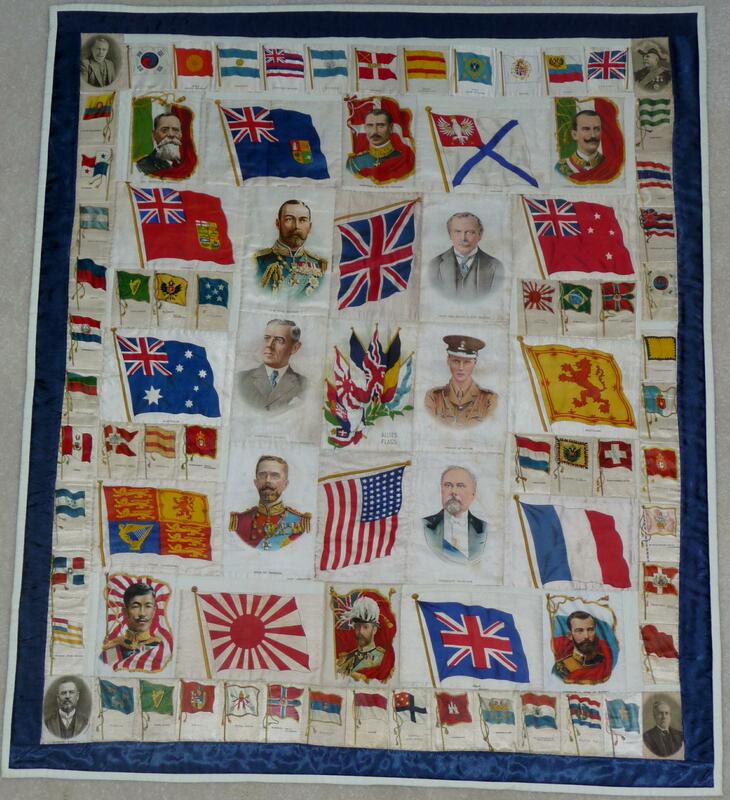 There are 85 silks representing various countries flags and leaders prior to and including WWI. 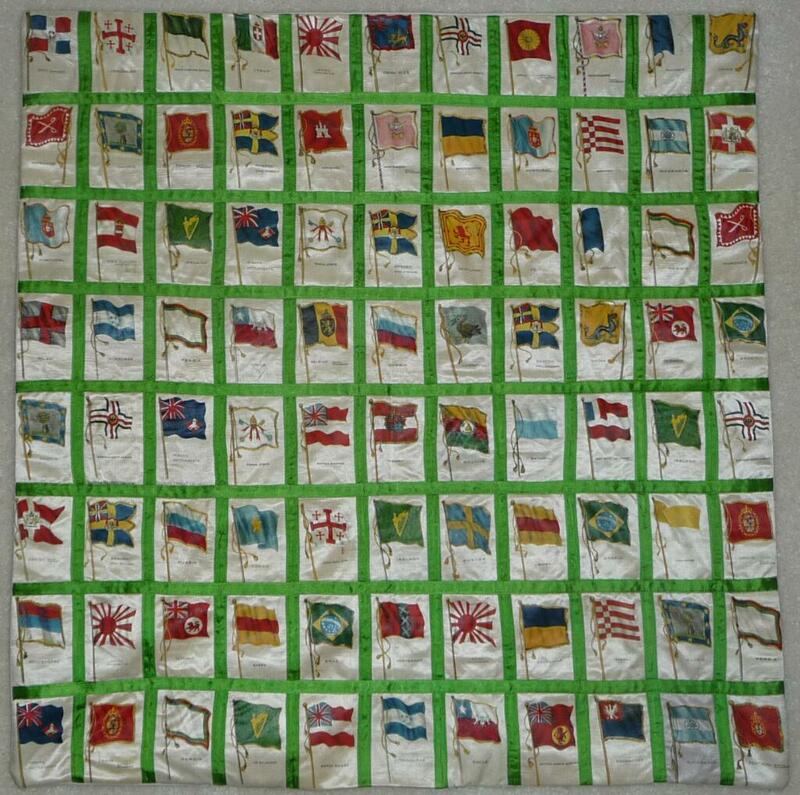 56 of the silks/satins are small flags in size 1.5” x 3”. 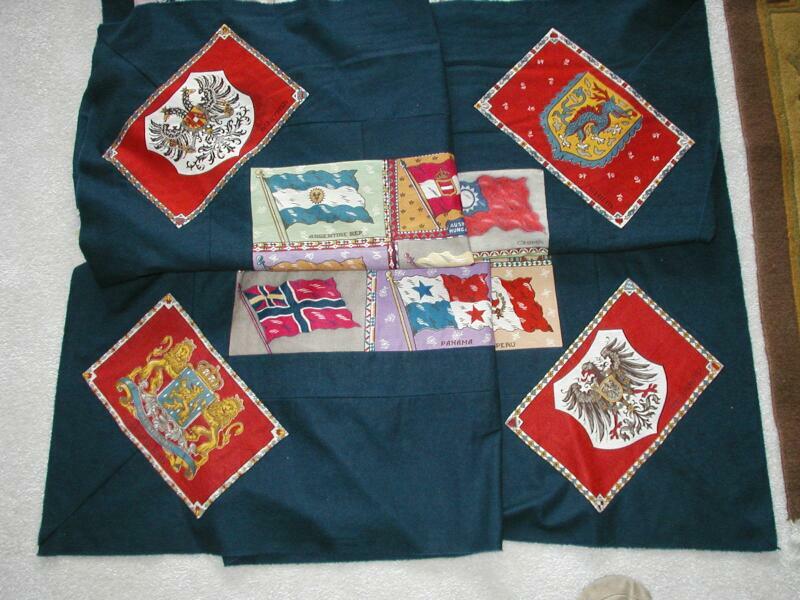 29 silks/satins are of larger flags and leaders pictures ranging in size to 1.5”x 3” to 4”x 8”. 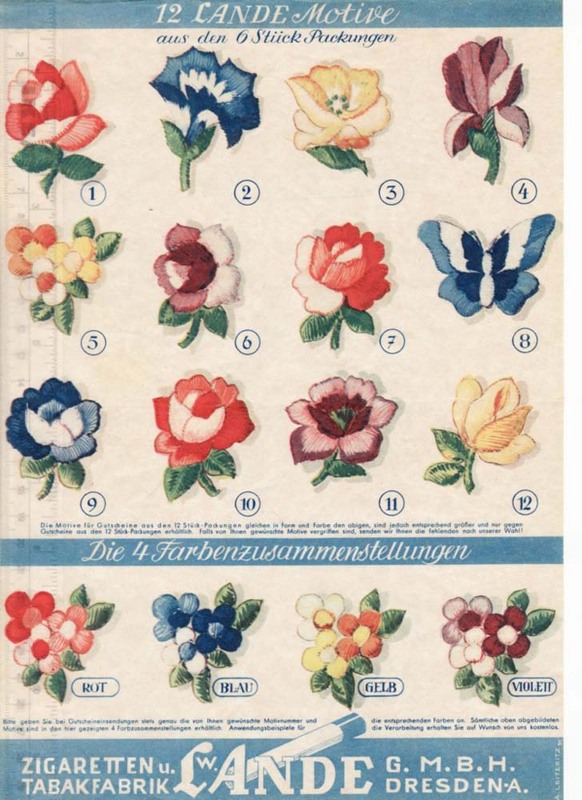 These silks or satins were tobacco/cigarette premiums given free by the British - B.V. D. and Sovereign cigarette companies. Most were issued from 1910 (USA became 48 states in 1912) to 1916. The flags show mostly shields of the monarchies at the time which disappeared after WWII. Quilting is done at 8 spi around all the pieces. 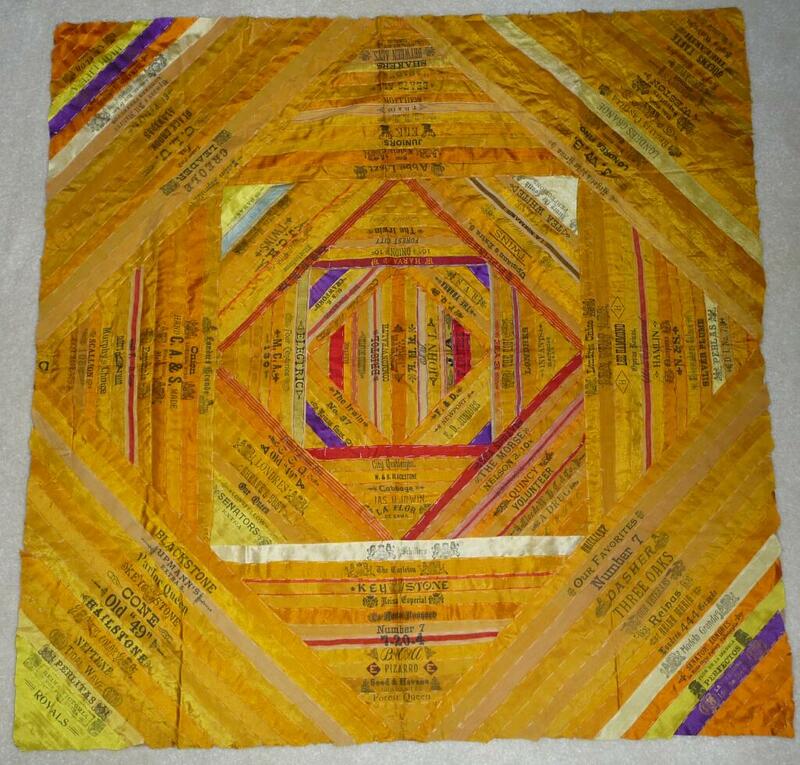 No interior quilting on the silks due the frailness of the fabrics. Some light age spotting and thin areas in the silks but no holes, tears or heavy stains. Right-click to select whole picture. 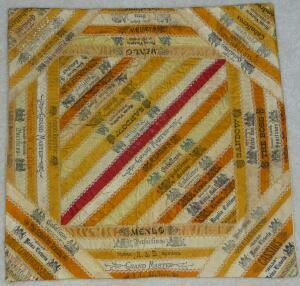 The smaller pillow cover is composed of 64 cigar ribbons with very few duplicates. It is in excellent condition with a bit of light water staining but no tears or holes. The back is a heavy gold satin fabric and the feather stitching on every ribbon edge is done in thick cotton thread. The larger ribbon top has approximately 200 ribbons that are basted to a silk foundation fabric with few duplicates and no damage. The embroidery feather stitch is yet to be completed. During the late nineteenth century most men enjoyed a good cigar. Because many cigars were made and sold locally there were cigar manufacturers everywhere. With thousands of brands to choose from there was keen competition among companies (many from Cuba) to establish their name as the best. Cigars were often sold in bundles wrapped by a silk ribbon with the brand name printed on it. These ribbons served not only the practical purpose of packaging the cigars but also as a way to attract buyers to a specific brand. Often ribbons were made with low grade silk but a few companies used fine silk with their name woven into the fabric to show that their cigars were made with a higher-grade tobacco (some are seen in this pillow cover). 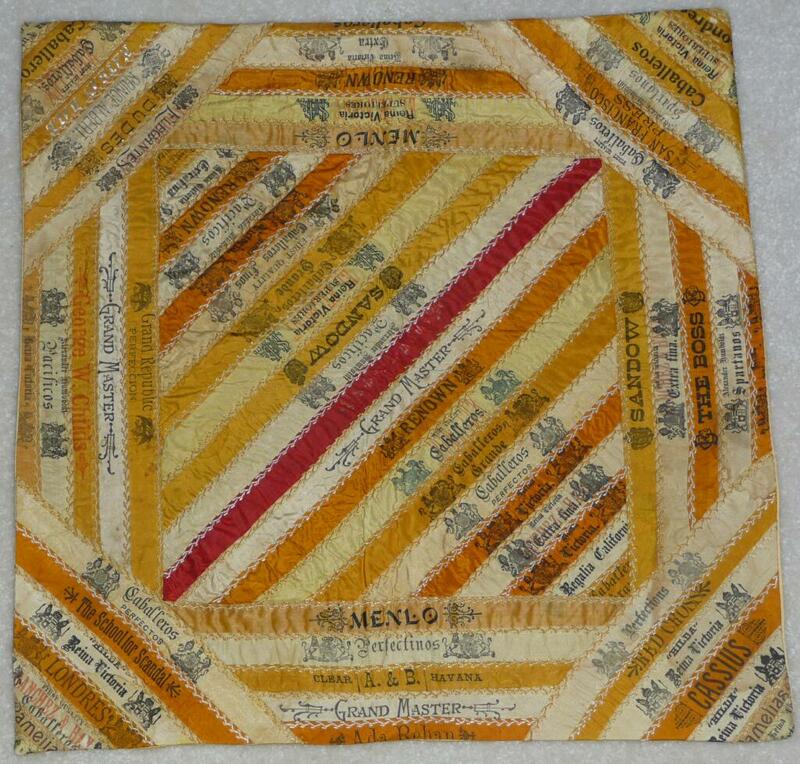 To create these decorative items cigar ribbons were often stitched on a muslin backing using fancy embroidery stitches. 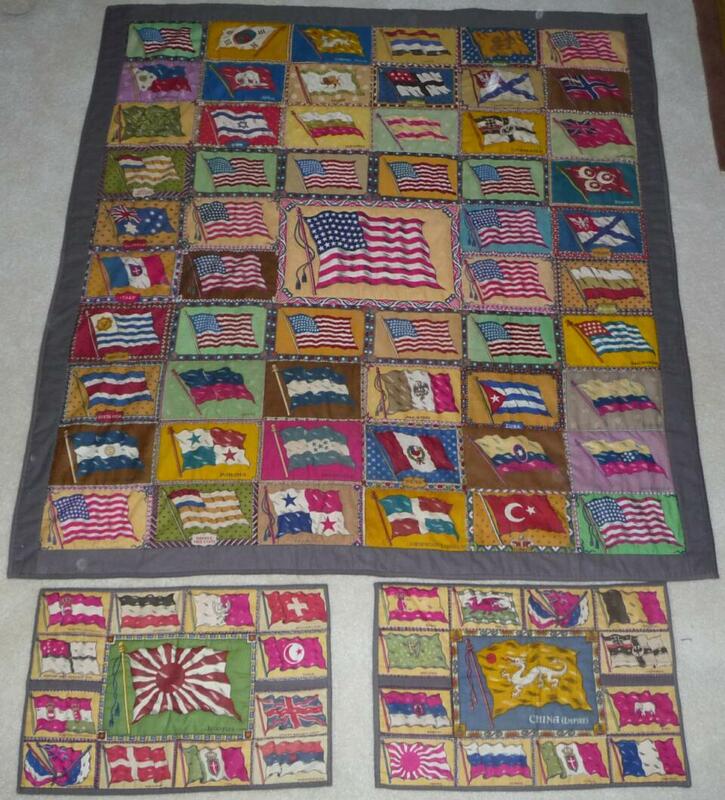 1912-1916 - 50" x 53" and 13" x 20"
These flannel flags represent countries prior to WWI when many were monarchies. America became 48 states in 1912 hence the large center flag (10" x 16") and the 16 smaller flags (5" x 8") all have the 48 stars. 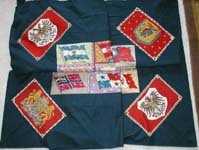 The two pillow covers each have a large center flag (8" x 10")with one showing China and the other Japan. 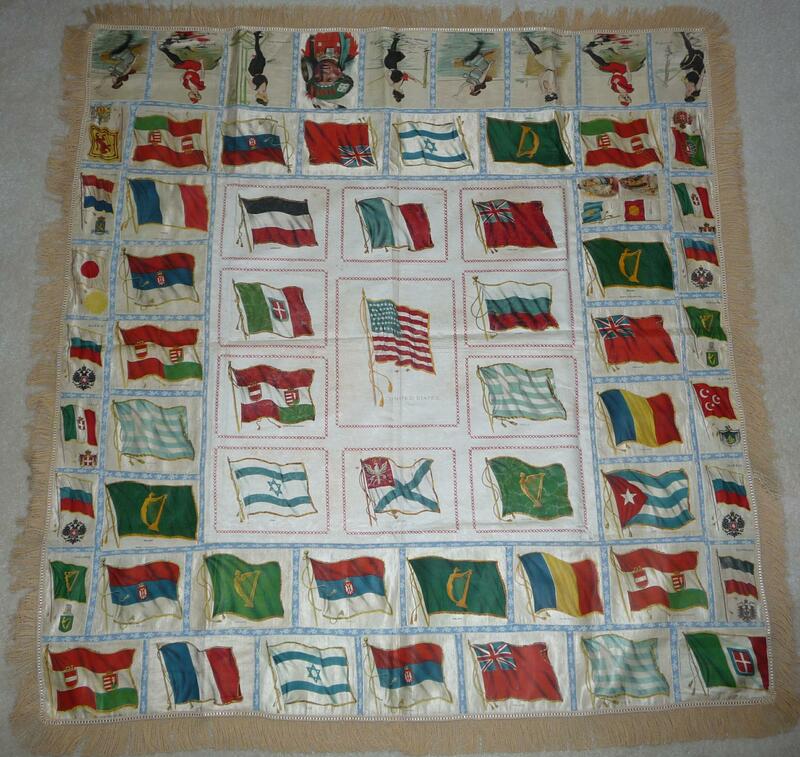 The smaller flags on the pillow covers are 3" x 5" also each pillow cover has a smaller flag named Triple Entente showing the 3 flags representing France, Russia and Great Britain. The laptop quilt has a 2" border in dark grey flannel and all 3 items have the same dark grey flannel backs and bindings. 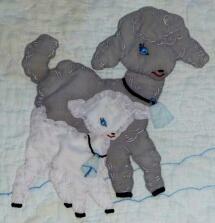 All are hand pieced and hand quilted on all vertical and horizontal lines. 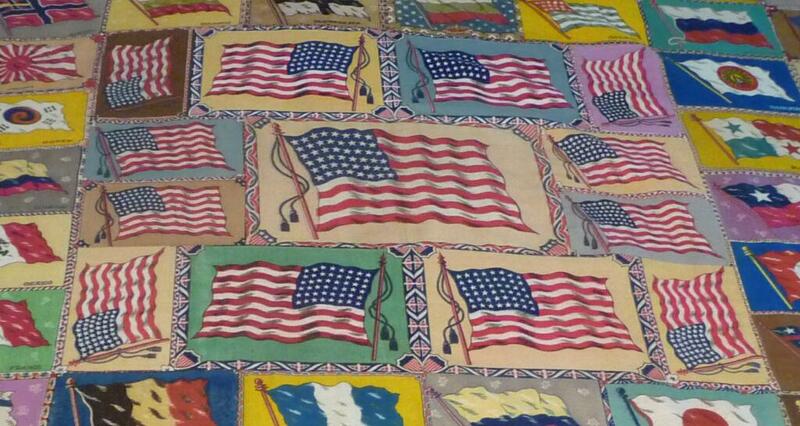 The quilt and pillows center flags have also been outline hand quilted. All are in pristine condition. 7. Large Silk Flag Table Top - 1912 - 42" x 45"
The flags and Indian Chief in this tobacco premium silk top have a most unique center "cheater"piece that measures 19" x 20" consisting of 10 flags (OLD MILL and B.D.V. cigarettes) which represent various international countries and an American flag. (The Nebo brand Lorillard issued 12 pillow-top's in this series including flags, baseball players, Indians, famous generals, etc.) The smaller flags are 5" x 6" and the American flag with 48 stars is 8" x 10". Also there are 49 - 5" x 6" international country flags and 18 - 2" x 3" flags including 2 Queens. The 7 Hamilton Beach Girls (ZIRA cigarettes) and an American Indian Chief (TOKIO cigarettes) are all 5" x 6". They are sewn on top of a light blue lacy fabric with a 2" gold fringe surrounding the whole piece and backed with muslin. 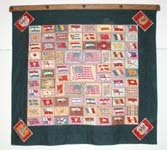 The red cross stitch seen in the center is printed on the silk and not embroidered. Condition is excellent. Here are 12 silk flags measuring 4.5” x 5.5” each. 9 represent individual countries and they are Austria, France, Germany, Greece, Ireland, Norway, Poland, Sweden and Turkey. The Sicily flag is a city in Italy; the Jewish flag is for the religion and the Confederate flag (which is extremely rare) is for the rebels after the end of the Civil War in the United States. The item is in excellent original condition. 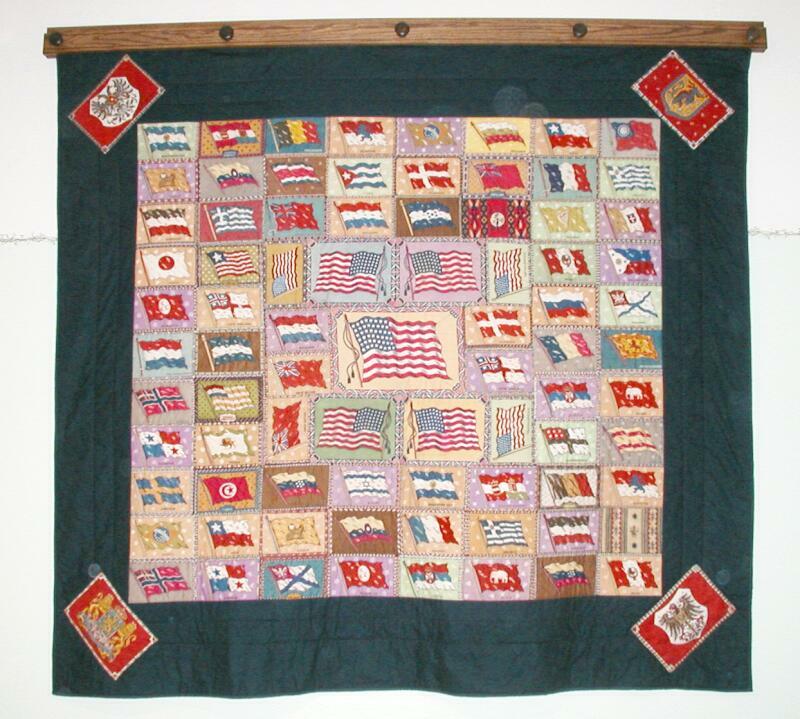 The flags are stitched together with a ¼” green silk ribbon and then machine quilted between the flags. 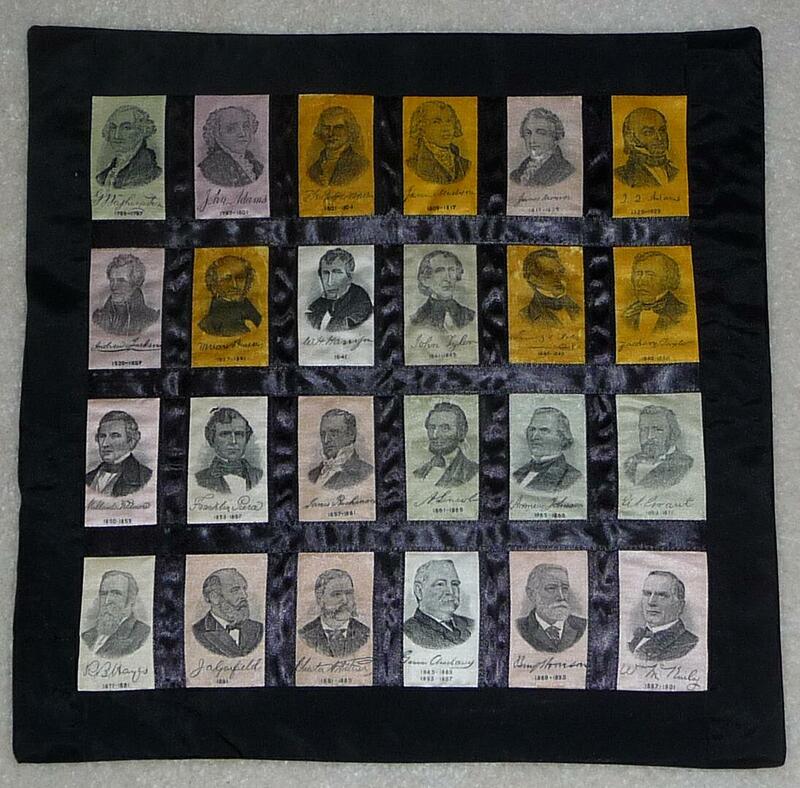 These 24 U.S. President silks were issued in 1910 and sold through MOGUL Cigarettes. A silk was included in each pack of cigarettes to collect all the Presidents up to that time. There are only 24 shown but they represent 25 Presidents as Glover Cleveland (see bottom row 4th from the left) had 2 not contiguous terms which were interrupted by Benjamin Harrison's Presidency.